"Where does art come from?" my father, a man of the ripe age of 91 asked me the other day. He'd recently taken to perusing prints of famous paintings and was becoming curious about the artistic process. He put the question to me because I, as a writer, song composer and dabbler in the illustrative arts, am a font of knowledge on such topics. I opened my mouth, ready to put forth an erudite answer to his query. "You see, the way it works is..."
"Shut up and finish your applesauce." I realized I had no idea where art comes from. The question reminded me of the consummate philosophical conundrum that has echoed through smoky college dorm rooms since the dawn of time: what is art? After 30 plus years of consuming art, making art and thinking about art, I had more questions than answers. As such, it was obvious that the hand of God was at work a few days later when it placed before me the October 8, 2009 issue of the New York Review of Books which contained a review by painter/writer Julian Bell on a duo of books that addressed these very questions. (God is always performing minor miracles of convenience when he should be concentrating on big issues like the Palestine/Israel conflict.) 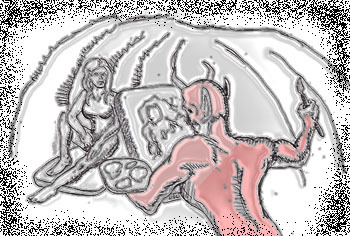 One of the books being reviewed, "The Art Instinct: Beauty, Pleasure, and Human Evolution" by Denis Dutton, made an argument --- one Bell found only partly convincing --- that human beings are wired by the evolutionary process to create and consume art. How does this work? Let me explain with a ornithological anecdote. Some years ago I read about one scientist's observation that the world of birds was full of deception. The primary example was a breed of birds who would use a high-pitched squeal to warn each other when predators were lurking. Birdwatchers observing this breed began noticing that if an individual bird found a bush rich with berries, he or she would emanate this squeal. The other birds would fly off in fear and this bird could eat all the berries for him/herself. Thus, this bird was more likely to survive and pass his or her genes on through reproduction. But as time went on, the other birds started to figure out the trick. They realized that they had to be a little more critical every time they heard this squeal. And, as these birds wised up, they increased their chance for survival and thus passing on their genes. So the trickster birds had to get even more clever in their tricks, and the birds being tricked had to get even smarter. As such, trickery was essential to these birds evolving into more intelligent creatures. So how does this relate to art? Well, art is a kind of deception. Let's look at the written word, particularly fiction. Fiction is largely the act of describing events that never actually happened. Fiction is lies, albeit well-intentioned lies. As evolution rewarded good liars, it was helping propagate the genes capable of writing good fiction. And what of music? Most popular song contains lyrics and lyrics are often fiction, or at least filled with metaphor and hyperbole. And even instrumental music is representative and symbolic. Imagine yourself sitting in your sofa with Wagner's "Ride of the Valkyries" blasting out of your stereo. As the pounding brass and strings approach a crescendo, your palms start to sweat and your heart picks up its pace. Why? You're not about to hop into your helicopter and strafe a Vietnamese village*. You're sitting on your sofa like a lethargic loser. Music is making you feel things --- sensations, emotions --- that aren't real. Music is lying to you. * As the music was used to accompany the classic scene in "Apocalypse Now." Okay, fine. So evolution rewards good liars and therefore propagates artistic tendencies. And those who inherit genes rich with those tendencies make good artists*. But the artist is only one half of the equation of art. What about the audience? Does human nature make us prone to fall for falsehoods? * This evolutionary analysis of art also explains one of life's great mysteries: why are women attracted to artists? Take a look at your average male struggling musician/writer/artist. He's a scrawny, flea bitten scally-wag who hasn't showered in three days. Yet there's no end to the line of man hungry trollops ready to bed him. Because they understand he has the genes of deception racing through his DNA, genes that will give their children a greater advantage at life. Interestingly, one need only jump forward a few pages in the same issue of "The New York Review of Books" to an article by William Easterly called "The Anarchy of Success" to find commentary related to this very question. In making the point that authors and economists often misread financial data he states, "Humans are suckers for finding patterns where none really exist, like seeing the shapes of lions and giraffes in the clouds." That seems to pass the smell test. We've all seen movies of human ingenuity or fortitude and yearned for them to be true. (Strangely, we've also all seen movies of nuclear apocalypse with the resulting destruction of all authority and found part of ourselves also yearning for them to be true.) And one of the great disappointments is to find out they are not. As humans, we like to be fooled. So question that pops up is "did we evolve this way?" In the appendix to Robert Wright's new book, "The Evolution of God," the author makes the argument that indeed we did. A simplified form of his argument breaks down to this: for most of man's evolution, we existed in groups of 20 to 40 people e.g. tribes. These tribes usually had two or three Type A personalities who were leaders. These leaders, in the interest of cementing power, often told exaggerations or outright lies. Because an individual's very existence was dependent on being part of the tribe, it was better for him or her to accept these lies than to critically analyze them for flaws. Those who aggressively criticized the leaders' stories were cast out of the tribe and denied the chance to reproduce. As Wright points out, this explains the phenomenon of Stockholm syndrome where a person is kidnapped and soon finds themselves sympathetic to the kidnappers who they are dependent upon for their survival. Let me leave you with one final thought. Is it possible that the genes that encourage the creation of art are the same as those that encourage the consumption of it? Let's look back to that notion of seeing lions and giraffes in the clouds. Is "seeing" images in clouds itself a work of art? The viewer's brain is constructing a representational image out of blobs of water vapor. Is that so different than assembling a statue for blobs of clay? What an artist essentially does is take materials --- paints, words, vibrations of sound -- and encodes them into a work of art. The audience decodes those works -- that's what you're doing when you observe a bunch of paint on a canvas and recognize it as the Mona Lisa. Are those two skills intertwined or even the same?